BMS design and manufacture bespoke full vehicles, vehicle subsystems and components (including road and race car parts and bespoke parts). The core of our experience is in automotive and motorsport. We are experienced in designing and manufacturing components for race cars, rally road cars, electric cars, sports cars, one-off bespoke vehicles, off road vehicles and armoured vehicles. We have designed and manufactured for Formula Ford, British GT, World Touring Cars and World Rally Cars. We are currently working on an electric sports car for the road. We have experience working with TVR Sports Cars, Ginetta, GM, Lotus, race and rally teams. We develop full vehicle projects for niche small volume OEMs. BMS Director Dan Boardman developed the TVR Sagaris, as quoted by Jeremy Clarkson “…the best TVR ever made.” . Dan designed the chassis and suspension whilst project managing the full vehicle. Dan also put the Ginetta G50 into production as senior project engineer. Dan has been involved with the full vehicle life cycle, from full vehicle architecture, suspension geometry & component design, production tooling manufacture, research and development whilst working as a development engineer and test driver. Dan has been heavily involved all vehicle sub systems and mostly enjoyed designing suspension systems and developing vehicles ride and handling characteristics. Dan has been involved with road, race and rally and is familiar with full vehicle FIA and MSA homologation. BMS are happy to undertake a full vehicle project in virtually any aspect from design to project management. 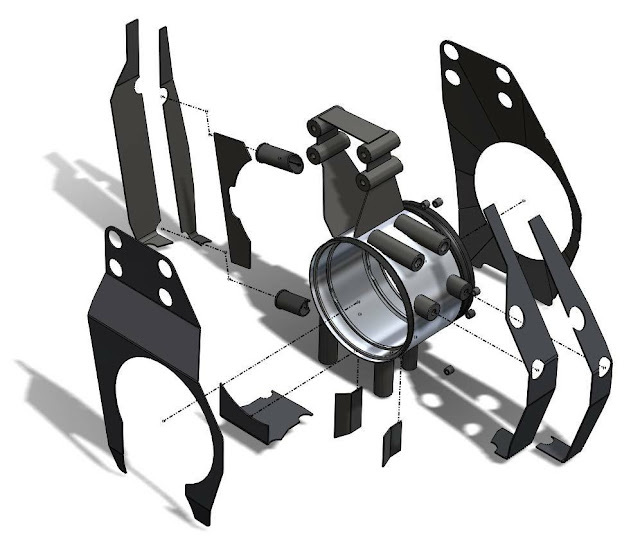 BMS design and manufacture road and race car parts, from suspension components to bell housings. We have all round experience as mechanics, drivers and designers, which we feel give us the best all round knowledge of understanding the environments components have to work in and the importance of weight, durability and simplicity. After-all F=MA! BMS engineers have extensive experience working in the heart of the Motorsports sector. From blank sheet design and manufacture of a Formula Student car, which won best British Design in 2002 IMECE Formula Student competition, to design and manufacture of the chassis, suspension and fuel system of the TVR Sagaris and Ginetta G50. Race cars; TVR Typhon GT1, TVR Speed 12, Panos GT1, Pescarolo, Raynard Formula Fords, Juno, Zytec, G50, G50 GT1. Rally cars; Group A Subaru Impreza, Group A Mitsubishi Evolution, Peugeot 205, Peugeot 206, Group N Ford Fiesta ST, Ginatta G20 Prototype Rally Car, Group N Suzuki Swift Group.